What does a REGI staff member do for fun on a day off? Go out and watch birds, of course! On Saturday, May 9, my wife Evelyn and I, with our two dogs Dory and Ranger, packed our binoculars, spotting scopes, bird books, and a thermos of good, strong shade-grown, bird-friendly coffee into our vehicle and headed out to watch and count birds. 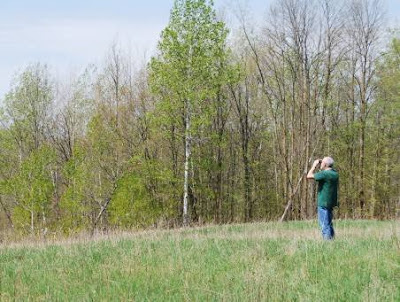 We participated in the Wausau Bird Club’s annual spring count in Marathon County, and this year our assigned territory included an area in the northeast portion of the county. Driving slowly through the beautiful spring countryside, stopping to watch and listen along a river or stream, and taking walks with binoculars and the dogs (who were very cooperative and seemed to enjoy the experience as much as we did), we saw and heard many interesting birds during the day. Some of our highlights included: Broad-winged and Red-tailed Hawks, Bald Eagles, Wood Ducks, Bobolinks, Clay-colored Sparrows, an Eastern Wood Pewee, and various colorful warblers. We ended up with a total of sixty-seven different species as we finally headed home in the early evening. Our day spent outside reminded us that there is plenty of beauty, drama, and variety in our local part of the natural world. If you are looking for something to do that’s simple, educational, and fun, get outside and look up and around; the sights and sounds of the world of birds are just out your door or around the corner or down the road. You may see the brilliant flash of a Yellow Warbler flitting around the shrubbery, the soaring mastery of a circling Turkey Vulture, the orange of a Baltimore Oriole or the red of a Scarlet Tanager. You might hear the croak of a raven or the soothing song of a Hermit Thrush. 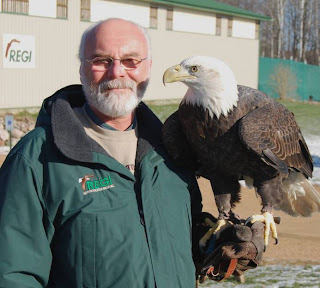 Whether you study one of REGI’s raptors up close during one of our summer tours or public programs, watch an American Kestrel hover expertly over an open field, or see a Great Blue Heron stand alert and motionless at the edge of a river or lake, the bird world is waiting for you. It’s a great place to spend your day off! First Tour of the Season! Thank You Hawthorn Hills Elementary School!